Buy Online Now! 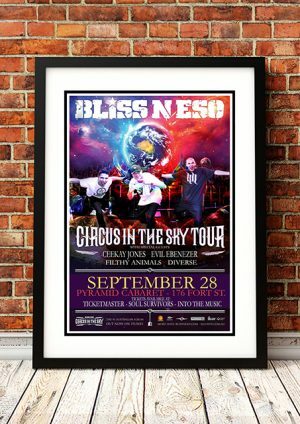 - Bliss N Eso Concert Posters and Memorabilia. As the small Australian hip-hop scene grew, it developed an identity influenced by, but distinct from, that of American hip-hop. 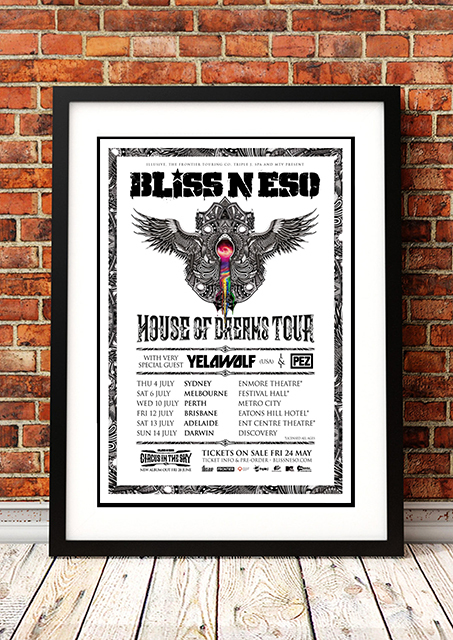 Straddling the line between the two is Bliss N Eso. Originally known as Bliss N Esoterikizm, a name that led to problems with pronunciation among their fans, the group consists of MCs Bliss (Johnathan Notley) and Eso (Max MacKinnon) as well as DJ Izm (Tarik Ejjamai). 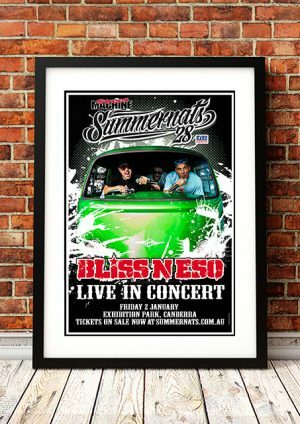 The two rappers are easily told apart on their records by the difference in accents between American-born Bliss and Australian Eso. The group first met while attending the same high school in Sydney in the 1990s. At that point the local hip-hop scene was so small that they thought they were the only such group in the country. We stock an awesome Bliss N Eso Concert Poster from their Australian Tour in 2015.